FIRST RACE: 1. Signature Cat, 2. Cheap O Charlie, 3. Ministers Prayer. LONG SHOT: Roper. SECOND RACE: 1. Industry Leader, 2. Pray Hard, 3. Love Forever. LONG SHOT: American Act. THIRD RACE: 1. Ghost of Navigator, 2. Cyrus Alexander, 3. Nob Hill. LONG SHOT: Scorpious. Barn has always been high on this son of Mineshaft, but GHOST OF NAVIGATOR (30-1) just hasn’t put it together. This is a tough maiden heat, but worth a stab at the price for trainer Ron Ellis and jockey Tiago Perez. The 3-year-old has shown improved works and should be worth a couple of bucks on win end and underneath the favorites in the exacta. FOURTH RACE: 1. Shanty Irish (best bet), 2. Go Trumpy Go, 3. Young and Hungry. LONG SHOT: Perfect Temptation. Trainer Mike Puype must want to get this Cal-bred SHANTY IRISH (8-1) on the grass pretty bad as he runs in an open MSW. Breeding says yes to the grass. Pressed that pace in debut, has good work coming into race down the hill and jockey Elvis Trujillo sticks. FIFTH RACE: 1. Firing Line, 2. Dortmund, 3. Rock Shandy. LONG SHOT: Tizcano. SIXTH RACE: 1. Cautious Giant, 2. Whine for Wine, 3. Pulling G’s. LONG SHOT: Kristo. SEVENTH RACE: 1. Quadrivium, 2. Finnegans Wake, 3. Patrioticandproud. LONG SHOT: Dyanmic Sky. EIGHT RACE: 1. Bronzo, 2. Shared Belief, 3. California Chrome. LONG SHOT: Tonito M.
Yes, this is a tough spot for BRONZO (20-1) with the likes of Hoppertunity, Shared Belief and California Chrome in the race, but trainer Neil Drysdale has been quoted as saying the longer the better for this Chile-import. Jockey Gary Stevens got familiar with him last time and hopefully learned something. NINTH RACE: 1. Arethusa, 2. Our Little Hen, 3. Dakota Kid. LONG SHOT: Kyiaki. Jockey Victor Espinoza was more than happy when Kentucky Derby morning-line favorite California Chrome (5-2), who trains at Los Alamitos Race Course in Orange County, drew the No. 5 post for Saturday’s Run for the Roses in Louisville, Ky.
“It’s my lucky number,” said Espinoza. Espinoza won the Kentucky Derby aboard War Emblem from post No. 5 for trainer Bob Baffert in 2002. 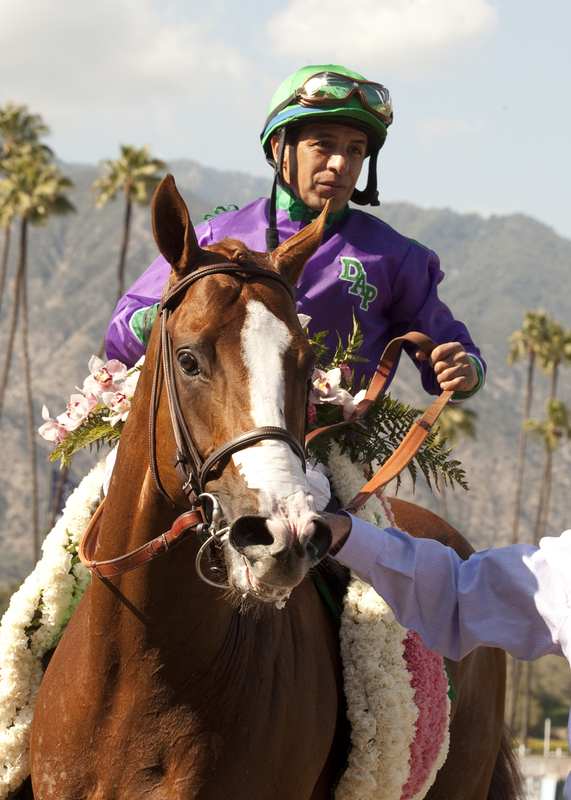 California Chrome also won the Santa Anita Derby from post five in his last start and the 3-year-old, trained by Art Sherman, will be looking for his fifth straight victory on the track. With California Chrome’s tactical speed, the No. 5 post should not prove a problem as Espinoza should be able to get out quickly and place him where he wants. Sherman obviously didn’t want to draw the No. 1 hole like Louisiana Derby winner Vicars In Trouble (30-1) did or the outside post in the 20-horse field like Wood Memorial winner Wicked Strong (8-1). California Chrome has been a step slow in two of his last five starts, but Sherman isn’t worried. Arkansas Derby winner Danza (10-1) drew just inside California Chrome in the No. 4 post. Other California horses drew toward the outside in Hoppertunity (6-1) at No. 11, Dance With Fate (20-1) at No. 12, Chitu (20-1) at No. 13 and Candy Boy (20-1) at No. 18 for trainer John Sadler and jockey Gary Stevens. Hoppertunity, who finished second to California Chrome in the Santa Anita Derby, was made the second choice on the morning line after Wicked Strong drew the outside post. However, four of the last six Derby winners have come from the auxiliary gate (post No. 15 and out) and the last three in a row have come from there. Baffert trains both Hoppertunity and Chitu. He was fine with the draw for both. Chitu is expected to be part of the speed in the 1¼-mile race. Trainer Peter Eurton didn’t have a problem with Blue Grass winner Dancer With Fate’s draw. Sadler said he doesn’t worry about post draws. Stevens said he was already planning a strategy as the draw progressed, but he wasn’t giving away any trade secrets. FIRST RACE: 1. Road Ready, 2. Newfound Gold, 3. Trucial State. LONG SHOT: El Pitucon. SECOND RACE: 1. Mum, 2. Dancinginthestreet, 3. Courageous Call. LONG SHOT: Tiz Champ. THIRD RACE: 1. Honduran, 2. Seeking the West, 3. Footbridge. LONG SHOT: Perfect Set. FOURTH RACE: 1. Ryleigh Ruler, 2. Wild Optimism, 3. Betty Bing Bing. LONG SHOT: New Nature. RYLEIGH RULER, a daughter of Roman Ruler, might have won her career debut at Del Mar last summer except for a poor start. She returns here and obviously trainer Robertino Diodoro knows how to get one ready to run, especially after a long layoff (30%). FIFTH RACE: 1. Ambitoness, 2. Smart N Dreamy, 3. Spiced Latte. LONG SHOT: Miss American Pie. SIXTH RACE: 1. Neurosurgeon, 2. Slight Edge, 3. Storm Bird. LONG SHOT: Grey is Best. SEVENTH RACE: 1. Mark of a Gem, 2. Tiz a Kiss, 3. Tribal Chatter. LONG SHOT: Noise of the Crowd. EIGHTH RACE: 1. Even Echo (best bet), 2. Warrensgoldenyears, 3. Wicked Heat. LONG SHOT: Fuzzy Logic. Yes, this 3-year-old colt, EVEN ECHO, was favored last time in the drop to the maiden claiming ranks, but we’re willing to give another shot. Look who he has lost races to in the last few races: Hoppertunity, Shared Belief, Enterprising. Maybe this is the day he outclasses the field. FIRST RACE: 1. Geldautomat, 2. Cousin Ricky, 3. Mr. Cactus. LONG SHOT: Goldnesian. SECOND RACE: 1. Sweet Spell, 2. Provenance, 3. Seattle Charlie. LONG SHOT: Wasted At Midnight. THIRD RACE: 1. Madoffwiththemoney, 2. Metaxa, 3. Warren’s Judy. LONG SHOT: Backwoods Belle. FOURTH RACE: 1. Cougarontheprowl, 2. Our Pure Creation, 3. Small Moves. LONG SHOT: Kerrilynn. FIFTH RACE: 1. Moonlight Stroll, 2. Chicago Angel, 3. Mini Candy. LONG SHOT: Alissa R N.
SIXTH RACE: 1. Readyforhercloseup, 2. Akiss Forarose, 3. Elegant in Silk. LONG SHOT: Incredible Journey. SEVENTH RACE: 1. Mark of a Gem (best bet), 2. J and S Express, 3. Always a Chance. LONG SHOT: Yawannagokid. MARK OF A GEM, a 4-year-old filly, hasn’t raced since May 19, 2013, but she has speed and has been working well over the Santa Anita dirt. Trainer Tim Yakteen is 38% turf to dirt and he’s 36% with Hall of Fame jockey Mike Smith. EIGHTH RACE: 1. Los Borrachos, 2. Kozani, 3. Melatonin. LONG SHOT: J Kat. Jockey Mike Smith is looking for the late daily double here with this son of Pulpit. The 3-year-old LOS BORRACHOS isn’t drawn ideally for a down-the-hill effort on the rail, but Pulpits seem to do well in the move from dirt to turf. He showed improvement in his second race and comes out of a maiden race where a horse he beat by 2 lengths (Hoppertunity) has already come back to win.